The Anglican Church has come out in support of the ‘Justice4Vernie Movement’ that has been launched in Cape Town. The movement was launched at St George’s Cathedral to honour the late Director-General of Correctional Services, Vernie Petersen, who died after a short illness in 2011. Petersen’s name came up during the Zondo Commission into State Capture as having refused to be bribed into extending Bosasa tenders. Former Finance Minister Trevor Manuel also spoke at the launch of the ‘Justice4Vernie’ Movement. Manuel says corruption is rife because the leadership of the country has stopped asking questions. Manuel says things have gone wrong in recent years. 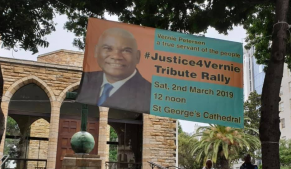 The post Anglican Church supports ‘Justice4Vernie’ Movement appeared first on SABC News – Breaking news, special reports, world, business, sport coverage of all South African current events. Africa's news leader..